When The Carter Center began fighting Guinea worm disease in 1986 there were an estimated 3.5 million cases of Guinea worm disease (dracunculiasis) occurring annually in 20 countries in Asia and Africa and more than 120 million people were at risk of acquiring the disease. In 2002, there were approximately 55,000 cases reported from only 13 countries, less than 2 percent of the annual burden of disease in 1986. The Carter Center leads the global campaign to eradicate Guinea worm disease in the countries that remain endemic. Among the most endemic is Togo, where Carter Center Public Relations Coordinator Emily Howard witnessed the debilitating impact that the preventable disease has caused. She observed the crusade of health workers in the field to build hope for millions. Following is her three-part account. Confronting the Worm When our Carter Center team arrived in Dofelgou District, approximately six hours North of Togo's capital, Lome, I was not the only one surprised that nearly everyone we met had Guinea worm disease. 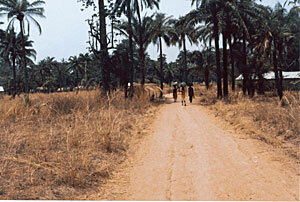 The field staff heard rumors that there was an outbreak in this village, which had been free of Guinea worm disease for eight years. In a country slightly smaller than West Virginia, it is hard to believe that Togo is today the fourth most endemic country in the world. As we moved among households in the village of Agbande, I captured images on film and video and interviewed locals. 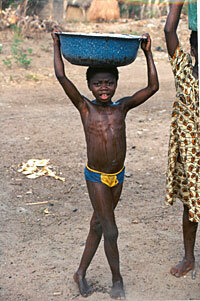 The previous day, in southern Togo, I had been impressed that people there had a good understanding of the disease. They knew that to prevent it they to had to filter drinking water before consumption and keep all infected people from contaminating local water sources. Yet while I knew more facts about Guinea worm disease than most in the United States or even in Africa, nothing could have prepared me for the real-life drama in Agbande. The first order of business for our team was to visit the various ponds, the only sources of drinking water for the residents of Agbande. The team measured the volume of water in these ponds and applied the recommended dose of ABATE®, a chemical donated by BASF Corporation, which is used to kill the tiny "water fleas" that harbor Guinea worm larvae. Afterwards, our group trekked about a half a mile through low brush in the sweltering sun to visit a woman named Karamoua Komma and her six children. Her husband was away farming in the field. After we exchanged the proper greetings and explained the purpose of our visit, she allowed our team to examine her children for emerging Guinea worms. We first noticed Akouma Witchikitike - a girl about the age of 10 - whose right foot was extremely swollen and infected with a large festering blister, the typical sign of Guinea worm disease. The infection greatly increased the pain she experienced, and if left untreated, Akouma could have become crippled for life. As it was, the barely emerging Guinea worm in her foot made it difficult for her to walk and do daily chores, which included fetching water, caring for her brothers and sisters, gathering wood, and cooking. Golda, a trained nurse and Guinea worm patient care expert, briefly explained to the curious girl how the Guinea worm must be manually pulled out in order to cure her. The entire family gathered around tight while I quietly moved around to capture the process as a timeline. Only a few minutes into the procedure, bloodcurdling cries pierced my heart, and as a natural reaction, my eyes filled with large reservoirs of tears blurring my vision, but I continued to operate the cameras. Mr. Ignace Ambegbo, Togo's Guinea Worm Eradication Program National Coordinator, placed his hands on her shoulders and softly hushed the child like a father might. Akouma's younger brothers and sisters stared on while Karamoua, rubbing her face, quietly wept for her daughter at a distance from the group. After 30 minutes of massaging the area of the wound and gently pulling the Guinea worm. Golda removed a tiny, undeveloped worm, only to find another much larger one behind it. She again massaged the wound and more pus oozed out; the infecting worm was now showing. With some careful maneuvering, Golda pulled out nearly 12 inches of the Guinea worm. Not only had Akouma's foot been extremely infected, but also the worm had coiled itself inside the flesh of her foot. As everyone took a few deep breaths to digest the tension, Golda placed a cool cloth on Akouma's recovering foot. Akouma tried to catch her breath, her tiny chest heaving. As people have done for thousands of years, Golda wrapped the pale white emerging Guinea worm around a small stick and applied antibiotic ointment and a gauze dressing to the little girl's foot. There would be three more Guinea worms to extract from the little girl's body that day, two from her arms and one from her leg. In areas with endemic Guinea worm disease, infected persons usually have more than one Guinea worm emerge annually. In general, the higher the prevalence of the disease in an area the greater the likelihood those individuals will have multiple Guinea worms emerge during the year. All of Akouma's worms would have to be pulled-on and the wounds cleaned and dressed until the worms had been completely removed. During this process, the team recommended that Akouma stay home to ensure she would not unwittingly transmit her infection to others by entering one of the community's ponds. A person with Guinea worm disease is usually disabled for eight weeks, but this period is much longer if they have multiple Guinea worms emerge over a period of weeks or months. On average, Guinea worms are three feet in length. The "fiery serpent", as this worm is commonly called, refers to the burning sensation the victim experiences when the Guinea worm causes a blister to form on the skin and through which she becomes exposed to the outside environment. The intense burning sensation leads persons to unwittingly immerse their affected limbs in water to seek relief, and permits the Guinea worm to continue its life cycle by releasing its larvae into the water. There is no vaccine or medication to prevent Guinea worm disease, and there is no immunity either. During the next hour, our team extracted, rolled, and bandaged more than 20 Guinea worms from the six children. Then we noticed that Karamoua also had multiple Guinea worms. As the field workers treated the worms that emerged from the mother's legs, she softly mumbled a mantra - "pull them out, stop the pain..."
Sharing Knowledge From an outsider's perspective, preventing Guinea worm disease seems simple: don't enter the water with an emerging Guinea worm, and don't drink unfiltered water. But the challenge is in educating people to always filter their water and ensuring they have the necessary filters to do so. Once everyone had been treated, I asked Karamoua if I could interview her, so she could help me teach others why we must eradicate Guinea worm disease immediately. She agreed, and I set up my video equipment. Through consecutive translation - English to French to the local language and back - I asked her when she contracted her first Guinea worm. She replied that this was her first. This surprised me, so I asked a slightly different question:"When did you first learn of Guinea worm disease?" "Today," she replied. I was baffled; The Carter Center and Togo's Guinea Worm Eradication Program has been fighting this crippling disease for years - how could this be? All of a sudden, it hit me that I was in Africa asking a traumatized woman questions about a disease that she seemed to know less about than I did. The anthropologist in me had counted on her to say "stories of the disease have been passed down for generations" or "contracting Guinea worm disease is a 'coming of age experience'". . . . Instead, I was learning that Karamoua was surprised to experience these sores, which she said "appeared naturally." She first discovered them on herself then her children. "The sores just fell upon us," she said. Trying to comprehend her understanding of the disease, I asked how she was "concerned" or "worried" when these sores started appearing. There was a long pause, and through the lens of the camera, I could see Karamoua's face tighten-up, and her eyes began to fill. Slowly shaking her head as she spoke she said, "I have prayed every day to know what I did to bring this disease into my family and my village," and with that, she placed her head in her hands and cried. At this point, we all exchanged bewildered looks and stopped the interview immediately to understand what was happening. Were my questions offensive? Were there translation errors? What happened? I felt awful. Right on cue, Lady, the village health animator, consoled the woman. He explained that Guinea worm disease is contracted when stagnant water, contaminated with microscopic fleas carrying infective larvae, is consumed. Lady used images in a health education comic book to explain Guinea worm and the disease cycle. He told her that inside a human's abdomen, the larve mature and grow, some as long as three feet, and after a year, the worm migrates in the body (usually to the lower limbs) and slowly emerges through an agonizingly painful blister in the skin. Karamoua began to calm down and became curious. All the children started to gather and listen. I glanced down at the camera thankfully thinking how lucky I was that I hadn't turned it off, it had been running the whole time, the turn of events couldn't have been more perfect if they had been staged. Lady continued to educate Karamoua and her family. Karamoua was beginning to understand that sorcery did not cause her family's ailments. Karamoua began to cry again, but this time they were tears of joy, and she was thanking the team for this new knowledge. I might not have believed this scenario if I had not seen it for myself - the pain and despair literally evaporated from her face. This poor women had spent days blaming herself for something that she didn't cause but could have prevented. Karamoua said she had even sacrificed a chicken to try to protect her family. It was in that moment that I saw HOW Carter Center staff, in collaboration with the national programs, train local health workers to use educational material to explain the cause of Guinea worm disease and treat those infected. In addition, I better understood the challenges field staff face and overcome each day. It was with Karamoua and her family that I experienced the dynamics of how The Carter Center builds hope person-by-person, village-by-village in Africa and around the world. We later learned that someone from an endemic village in the south of Togo had traveled to the north to visit his family in Agabande, bringing with him many things, including Guinea worm disease. At some point during his visit to the community his emerging Guinea worm silently released larvae into the local water source, infecting the entire community a year later. The village of Agbande had not had a single case of Guinea worm disease in more than eight years, so it's not surprising that people like Karamoua didn't know of the disease. Today, The Carter Center and its partners continue to fight Guinea worm disease in Togo and the other 12 endemic countries, all in Africa. By actively surveying areas to make sure every case is reported and contained, the Center and its partners are steadily defeating a disease that has plagued the world's least developed countries for 3,000 years. As illustrated by Karamoua and her family, Guinea worm disease cripples victims, leaving them unable to work, attend school, care for their children, or harvest crops. Eradicating, or even just reducing, the incidence of Guinea worm disease in a country improves the status of life for all people, and children like Akouma no longer suffer needlessly. We must eradicate Guinea worm disease because we CAN. For The Carter Center it is a moral imperative to apply existing knowledge and resources to help the "poorest of the poor" to rid themselves of Guinea worm disease. The Carter Center brings together the essential ingredients for a successful eradication campaign - political will, financial support, and technical expertise. In collaboration with national Guinea worm eradication programs, the Center has reduced worldwide incidences of the disease from 3.5 million cases in 1986 to fewer than 55,000 in 2002, a reduction of more than 98 percent. Sudan presents the final challenge, accounting more than 75 percent of the cases reported in 2002. Armed conflict there has deterred the necessary interventions. In the history of mankind, only smallpox disease has been eradicated. Through the efforts of a worldwide coalition led by The Carter Center, this debilitating disease is poised to become the second. Once eradicated, Guinea worm disease will be the first parasitic disease to be gone forever. No one, including families like Karamoua's, will be free from the threat of Guinea worm disease until every case is detected and every worm contained. All Photos by Emily Howard The Carter Center team traveled to the Dofelgou District in the Kara Region of northern Togo. One year after contaminated water is consumed, the Guinea worm emerges from a blister – typically on a foot or leg.